cooooooold. 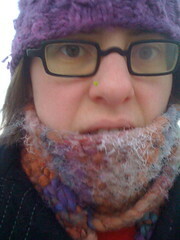 it was a high of 3 today, and it certainly wasn't that warm when i was walking to work at 6:45. as you can see, all my breath froze to my scarf. brrrrr.